SJ: How and when did your musical journey begin? 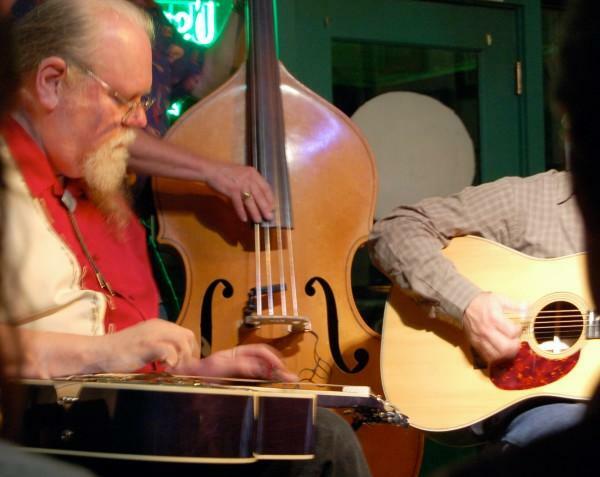 What inspired you to start playing the dobro? OJ: I was raised in a fundamentalist religion (Pentecostal, Assembly of God) where there was a lot of fervent singing. This was not choir singing, but instead the kind of singing that is full of holy spirit, hallelujahs and thank you Jesus! As a kid, I was somewhat mystified by the behavior of the adults (moaning, talking in tongues at the altar, etc.) but always loved singing. This was my earliest musical experience. I didn’t have a musical family except for one uncle who played guitar in a country band and had a silver metal flake Telecaster. In middle school I sang with a couple of rock bands. This was during the Beatles era when every kid stood in front of the mirror with a broomstick and bobbed up and down while singing, trying to imitate John Lennon. Two other musically significant events happened during this time period when I was about 13. A schoolmate of mine said one day, “Orville, you’ve got to come over and check out these records I’ve got!” I guess his parents must have been blues fans because these records were all the country blues greats that were being rediscovered and reissued at this time. Robert Johnson, Mississippi John Hurt, Son House and more. I’d never heard anything like that and was very taken with it. At the same time, a couple of my electric guitar playing pals had discovered bluegrass with one taking up banjo and the other mandolin. We were at a party one night, jamming ensued, and when these boys started in singing bluegrass tunes I was able to sing harmony parts not having a clue, of course, about the music theory of it but just being able to hear it. From my church singing I guess. We got excited and decided we had to start a band. Had to be either Mountain Boys or Ramblers. No mountains where I grew up (southern Illinois) but I lived near a creek. So we were the Silver Creek Ramblers. We needed a guitar player since my pals had abandoned their guitars for the banjo and mando. So my friends talked me into it. One loaned me a guitar, showed me some chords and gave me Doc Watson’s first record, the one with Black Mt. Rag, Deep River Blues, Sittin’ on Top of the World, etc., and said “learn to play like this!” Well, I’m still working on that! But it did get me started on guitar and as soon as I started playing in a flatpick style for bluegrass the memory of those country blues records came back to me and I started figerpicking as well. I did my first guitar picking gig one month after I started playing, a church coffeehouse date with my bluegrass buddies, struggling to play rhythm and sing at the same time. I was thrown into the deep end right away but I think it was good for me, forced me to work hard and fast to be able to keep up and set me on the path of a professional musician which I’ve followed for most of my adult life. I started on the dobro a couple of years after I started guitar. I had listened to Flatt & Scruggs and heard Josh but I didn’t really get into it until I actually saw somebody play one. A friend of one of my picking pals came by one day and had a dobro. His name was Don Starwalt and he kindly let me mess around with it, showed me how to hold the bar and even let me borrow it for a couple of weeks. That did it! I loved the sound and it was a lot easier for me to pick out melodies than on guitar. I suppose it’s that relation to the voice that the dobro has and I related to it in a much more “singing” way than I did to guitar. It seemed easier for me to use my ear to find my way around as opposed to guitar where I was much more concerned with technique and learning the “right way” to do stuff. This was also around the time that Mike Auldridge’s first solo album came out and that was really my dobro primer. I learned every note on that album by dropping the needle on it about ten thousand times. You know how it’s a big thing nowadays to do a performance where a group recreates an entire album? I think it would be fun to do Mike’s first album all the way through but I want to play the dobro parts! I’d have to brush up on them but I think it would all come back pretty quick. SJ: I love your lyrical style! You don’t sound like anybody else and I don’t hear many typical dobro clichés in your playing. How did your style evolve into what it is today? OJ: I think my playing evolved differently because I’ve never focused on ONLY bluegrass in the types of music I play. Of course, I’ve played tons of bluegrass and my initial study of the instrument was bluegrass intensive with MikeA, Uncle Josh, Norman Blake’s playing on the Circle Be Unbroken album, Brother Oswald and all, and I can be happy playing bluegrass all day long, but I also was interested in the blues, rock, and the popular music of the day. A couple of mental breakthroughs in my dobro playing came from Stacy Phillips and, once again, from MikeA. Hearing Stacy’s unique playing on Tony Trischka’s first album (Bluegrass Light) helped me realize that there was a lot more you could do with the instrument and hearing Mike’s version of Killing Me Softly (Roberta Flack’s hit song from the early 70s) on his second solo album (Blues and Bluegrass) gave me the idea that any melody can work on the dobro because of the vocal quality of the instrument. I realized that if I could learn how to coax that kind of beautiful tone out of the dobro I could play anything. I find discussions that revolve around “can you play swing/celtic/bulgarian/jazz/whatever music on the dobro” amusing because why would there be any limit on what you can play on an instrument that so closely recalls the human voice? Is there any kind of music that can’t be sung if you take the time to learn the rhythmic and harmonic peculiarities of the form? The key to making the dobro fit is to understand the finer points of the form you’re trying to inhabit. Then you don’t end up sounding like a bluegrass guy trying to play jazz. And you need rhythm players that can create a groove that helps you generate ideas in the particular style you’re working with. For example, on my version of the tune A Lua do Amazonia (on my Freehand CD) I got real Brazilian musicians (some really good ones, too!) for the rhythm section to inspire my improvisations and create an authentic rhythm sound that would help me dig into what I knew about that style of music (Brazilian jazz) and come up with stuff that was musical, in the style, and not some warmed over bluegrass licks applied to a chord progression. Plus, I try to base my improvisation around rhythmic and melodic motifs that I derive from the melody. I read a quote from Hal Rugg, the great steel guitarist, in answer to a query on how he can play so many sessions and not end up using the same licks. He said it was because he gets ideas from the melody of the song as opposed to fishing around a bag of licks. I actually try consciously to avoid dobro cliches in my playing. I want to play music, not licks. The most insidious lick of the modern dobro era is the fast triplet. JerryD perfected and popularized those licks way back in the 1980’s and, to me, he owns them. 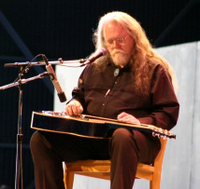 When I hear dobro players playing that kind of lick my first thought is always “imitation Jerry”. I try not to play them unless the melody calls for them though, I must admit, they sometimes creep in just because I’ve heard them so much that they exist in my mind’s ear but I really try hard not to resort to them. The way to avoid cliches and seek your own voice in your playing is to play melodies and songs and not think that having a catalogue of licks is the same thing as music. Even when I was first learning those tunes on MikeA’s first album I learned the SONGS and the melodies and didn’t deconstruct them into “licks”. Probably the second most insidious idea in bluegrass improvisation is that a song like, say, Shuckin’ the Corn, is just a three chord vehicle to cram as many G licks in as possible. To Lester & Earl that piece is a song with a melody and to strip it down to its chord progression and blow all your Gness all over it is OK, I guess, in a jam session, but to do it in front of an audience and think that it’s cool suggests to me that you haven’t really learned yet what making music is all about. SJ: You seem to really emulate the human voice in your playing, which is very cool! What kind of process do you go through in arranging a tune on the dobro? OJ: I go back again to the importance of the melody. The very first thing I do in arranging a tune is learn the melody exactly right. If I need to get sheet music or listen to a recording over and over I do whatever is necessary to get it right. Once I have that, I figure it out in at least two places on the guitar, high register and low and, depending on the width of the melody, on one string and also across the strings. Then I start examining the key I’m playing in. Some tunes are always played in a certain key (fiddle tunes) but some melodies lay out better in other keys. If I’m arranging the tune for solo dobro or dobro main feature I’ll go for the key it works best in for the dobro. If it’s ensemble playing and we have to be in the specified key I’ll figure it out in that particular key. I always do this without the capo. To me, a capo is a) last resort if the melody just can’t be played with good tone other than open key or b) used at a recording session where I’m required to play imitation banjo (rolls,banjo type rhythms) using open G patterns in another key. After I feel I’ve located the melody, found the key I like, and worked thru the melody in a couple of registers I start getting critical about tone. Tone and sound are actually more important to me than always playing the right notes. If I’m faced with the choice of fudging a note because the right note is just too hard to get in without sacrificing tone, I’ll fudge the note. I try hard to get both right, of course. I work for smooth movement and really like playing on one string or just on the two unwound strings to keep a consistent sound. When I’m improvising I’ll move around more specifically to take advantage of the contrast in tones between unwound and wound strings but when I’m stating the melody I strive for that consistency of voice. One last comment on this, coming back to singing. I think it’s good practice to be able to sing the lines you’re trying to play. When I’m learning a tune and come to a difficult passage, I don’t play it over and over on the guitar. I listen and sing at it until I can sing it correctly. Once I can understand the phrase and have internalized it through my voice I can play the phrase easily. 99 percent of playing music is not in your hands, your fingers, your muscles, but in your mind. Your mind is the boss of those other guys and I find that once I truly understand mentally what I’m attempting to do it comes to my fingers pretty easily. SJ: I would like to hear about your guitars and gear and such, but I would also be curious to know if you have any strong feelings about “guitar talk:” Specifically, it seems that there is so much chatter on the internet about “this guitar vs. that guitar and so on.. How important is a guitar vs. a player’s technique? Can you get “your sound” out of more than one guitar? And, finally..what guitar(s) do you own? OJ: I love guitars and gear, love talking about them and thinking about them but all the “is this one better than that one” yakking I find pretty boring. After a certain point where quality materials are being put together by experienced luthiers it’s all a matter of personal choice and what you like. And you can’t even begin to make an informed opinion about that stuff if you can’t play well or have unformed technique. And there is NO guitar that is the “ultimate” ax. To me, as a professional musician, they are tools and they need to sound good, play in tune, always work when I need them,and have an appropriate sound for the music I’m trying to play. I have 3 main dobros I use. My 1937 Style 45, a Rayco L-body maple, and a Guernsey. They all sound great and they all sound great in different ways. I like having a choice of sounds. SJ: Do you use a microphone and/or a pickup in performance? Any insights on performance sound vs. playing in one’s living room? I prefer the mic sound on my dobro so the way I deal with sound issues is to evaluate the gig. If the band is not too loud and the venue is more listener-friendly I’ll use the dobro. Loud band, loud venue, I’d rather bring my amp and play lap steel. Since I do play several instruments I have choices in this matter. Not helpful, I realize, for those that play only dobro. Performance sound: have a rig that is self-contained, that you know how to use and EQ properly, cables and accessories that WORK, and extras of everything. If you’re sending some kind of pickup signal to the board, have your preamp, effects, volume pedal, whatever, connected and gain structure balanced so you can hand one cable to the sound guy, he plugs it into the snake and turns up the volume and your sound is THERE. In your living room: sit close to the bass player so you can hear the groove. If the bass player’s not so good, sit close to the best rhythm player. SJ: In addition to dobro you play guitar and perhaps other instruments as well? How do you incorporate dobro into your live performances? Do you play any solo dobro gigs? OJ: I play several other instruments, mostly strings, some percussion and a little piano. Guitar is the instrument I make most of my living with but dobro is my favorite to play. I mostly get to use it for recording sessions and occasional sideman gigs. I don’t have a band that I exclusively play dobro with. 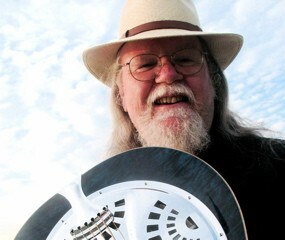 I do teach it a lot at music camps, I have a 2 volume instructional DVD set designed for beginners and a new one coming out soon on Doug Cox’s http://www.learnrootsmusic.com label that is a smorgasbord of techniques for the more intermediate level player. Check http://www.orvillejohnson.com for that stuff. I do include dobro in my solo performances. A usual 45-50 minute solo set of mine will start with me playing guitar and singing original and some cover tunes. I don’t generally do a lot of guitar instrumental pieces because I like to sing and use the guitar for accompaniment. I’ll do the last 15 minutes or so on the dobro and do some instrumentals and conclude by singing some blues accompanied by slide. I don’t do many purely solo dobro gigs but I have done a couple of nice ones in the past year. Just a few weeks ago I was on faculty at the Port Townsend Slide & Steel Guitar Workshop and it was a fantastic event. 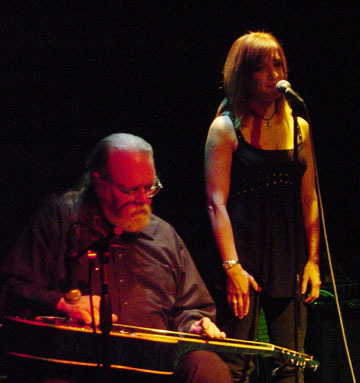 Sally Van Meter and I were the dobro teachers and had great students and classes. At the end of the week there was a concert open to the public in a 1000 seat theater onsite. It was packed full and the show went really well with Sally, the Campbell Bros., Freddie Roulette, Mike Dowling, Bobby Black, Dan Tyack, and myself. I was slotted for a solo set so I decided since it’s a slide event I should just play dobro. I had a couple of guitars with me so I had one in G and one in D and just went out with no setlist and played what came to me. Some instrumentals, one that I improvised on the spot, a couple of vocals and my 30 minutes flew by. It turned out great, audience loved it and it makes me think I should try that more often. A few months ago I played a little local gig at my friend Brad Inserra’s restaurant (Brad’s Swingside Cafe if you’re ever in Seattle and want killer Italian food!). Usually I play guitar, lots of instrumentals, it being a restaurant music type of gig, but this night I’d been playing my dobro all day and was in a dobrolic kind of mood so I took two dobros, left my guitar at home and did two hours of solo dobro. Once again, people dug it, I liked it and I don’t remember much of what I did because a bunch of it was improvisation as well as tunes I know. So I’m thinking more about solo dobro than I used to but I don’t have a good read on the market for it as yet. SJ: I assume that you’ve been playing music and the dobro for a good long while, correct? Do you have any closing words of wisdom that you can share with our readers? OJ: Yes, I’ve been playing music since the late 1960s, dobro since the early 70s and it’s been my profession pretty much exclusively since about 1971. I’ve played lots of bluegrass, country, blues, both electric and acoustic, in top 40 bands, theater music, TV and movie soundtracks and commercials, appear on over 250 CDs, and produced 21 projects for other artists as well as all my own discs. I try to keep busy. I don’t have any bumper sticker words of wisdom but I have learned a couple of things over the years. 1.) Find something you love to do and do it. For me, it’s music. I love to play it, talk about it, think about it, read about it, listen to it and I never lose interest in it. It’s a prism through which I understand a lot of everyday living type stuff and definitely more of a calling than a career to me. I can’t imagine myself not doing it. I think everybody needs something like that in their life. 2.) Try to improve yourself and learn from every situation. One of the great things about music is that it can serve many functions in people’s lives. Some people are hobbyists, content to learn some pieces by rote and play for their friends or families, some people use it as a meditation, some as relaxation, some as a social lubricant, and some take it to the next level of deep study and strive to discover their own voice. All these ways of experiencing music are wonderful and valid. There’s something to learn from every person and every musical situation you find yourself in. Sometimes you learn things NOT to do as well as things you should do. That’s pretty much how I learned to do recording sessions back in the 1980s, by being tossed into it with no experience, doing my best, being quiet and listening to the people that knew their stuff, observing bad behavior and making sure I remembered not to act like that, and being a person that is tolerant, friendly, easy to work with, not a whiner or complainer, who has fun doing what they do and helps everyone else have fun doing it, too. If you get a reputation for being like that people will call you. 3.) Strive to be a good musician, not just a good guitar player. For me, since I love all aspects of music, I can have as much fun playing a session as I do teaching a good class or playing a nice festival gig in front of several thousand people. The skills I need to be able to thrive in all these situations go beyond just being able to play my guitar well. I need to know how to arrange music, be a frontman or a sideman, understand recording techniques, teaching techniques, how to get along with and communicate with other musicians, audience members, record and show producers, etc. I know some folks just care about playing their chosen instrument but I think you can miss a lot of cool stuff if you’re too single-minded. Music is a vast and engrossing subject and a lot of valuable info is there for the taking, info that can help you in your everyday life as well as on the bandstand. And purely from a career standpoint, the more things you can do well, the more opportunity will present itself. Plus, dang! it’s fun! 4.) Share your knowledge. I’ve really enjoyed teaching over the years and I’m doing more of it now than I ever have. I usually do several week long camps in the summer and I’ve been giving private lessons again for the past year or so, which I hadn’t done for a long time. It’s not only a satisfying feeling to see someone get what you’re showing them but it’s incredibly beneficial to your own playing. You have to really understand what you’re doing on a deep level to be able to explain it to someone else. Getting to that level of understanding will improve your own playing.